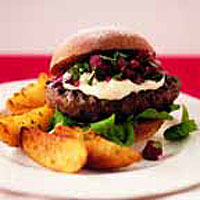 The beetroot salsa turns this burger into something really special. It's made with tasty baby beetroot from the fruit and vegetable section. The tender Aberdeen Angus burgers are available from the Meat Service Counter. Serve with frozen Waitrose Spicy Wedges. Preheat the grill to high. Chop the beetroot into small cubes. Place in a bowl with the onion, cumin, coriander and oil. Season, mix well and set aside. Cook the spicy potato wedges from frozen according to the pack instructions. Meanwhile, place the burgers on a foil-lined baking tray or grill pan and cook for 6-8 minutes on each side until thoroughly cooked, the juices run clear and there is no pink meat. Then split and lightly toast the rolls. Place a handful of rocket leaves on the base of each roll and top with a burger, a dollop of mayonnaise and some beetroot salsa. Replace the tops and serve with the spicy potato wedges.